Dungannon Swifts manager Rodney McAree knows his side face a tough task tonight at they host league leaders Crusaders at Stangmore Park. The Swifts themselves are still in with a chance of making the top six before the league breaks in two - as they lie seventh and only three points being sixth placed Glenavon. 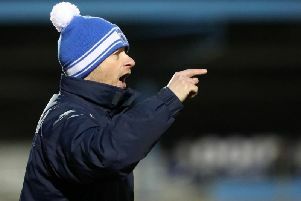 But McAree knows his side will have to be at their best against Stephen Baxter’s Crues and their disipline has to be better than last weekend against Coleraine. “I thought we had done quite well up until the sending off, it was an up hill battle after that. “I was very happy at half time, but I still thought we could do a bit better. “Unfortunately we’ve paid the price for a bit of ill-discipline, and the second goal Andy (Coleman) has made the wrong decision. “As a keeper you have to decide whether you come for a ball or not, as I say unfortunately it proved to be the wrong decision today and we have paid the price for it.